Google’s Farmer/Panda update serves as a reminder to online merchants that their non-paid search traffic is subject to an algorithm that constantly evolves. Pay-per-click advertising, on the other hand, allows merchants to diversify their revenue streams in a manner that’s more controllable. Indeed, online merchants who seek a true competitive advantage over their PPC competitors should focus on “conversion rate” and “average order value,” two critical post-click metrics. 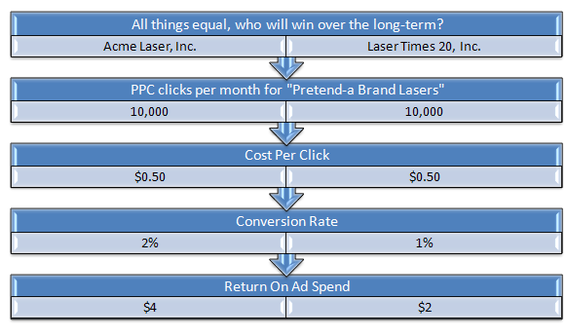 The following table illustrates the importance of optimizing your PPC conversion rates. It assumes a competitive environment between two hypothetical companies that (a) bid on the same term, (b) generate sales from this term, (c) produce an average order value from the term of $100. In this table of hypothetical companies, Acme Laser has a much higher “Return on Ad Spend” than Laser Times 20. As noted in the table above, Acme Laser has a major advantage over Laser Times 20 because its “return on ad spend” (“ROAS”) is twice as high. A $4 ROAS means that Acme Laser generates $4 in revenue for every $1 it spends in clicks. 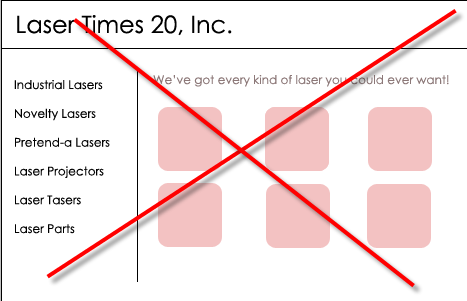 Laser Times 20 generates just $2 in revenue for every $1 it spends in clicks. Once Acme Laser suspects it has a conversion-rate advantage over Laser Times 20, it can exploit that advantage by out-bidding and out-budgeting its competitor. It will then increase its market share for “Pretend-a Brand Lasers,” and will generate profits that it can invest in other marketing activities, as it seeks to out-compete Laser Times 20. 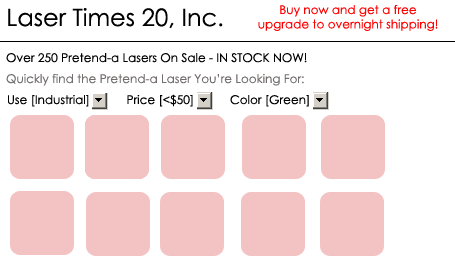 But what can Laser Times 20 do, since its competitor has a conversion rate advantage? It can resign itself to always being number 2 in both revenue and profits, or it can turn its weakness into an advantage by bolstering its PPC conversion rate. Here are five tips that will help both you and Laser Times 20 (“LT2”) increase pay-per-click conversion rates. 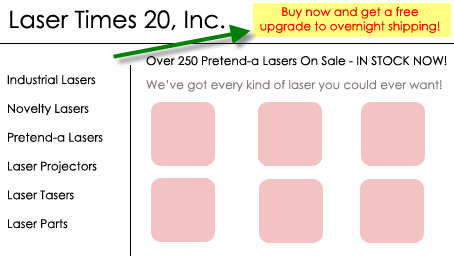 Let’s say LT2’s Pretend-a Brand Laser campaign includes the phrase “pretend-a lasers” on broad match, which triggers the ad when a shopper searches for “pretend-a lasers on sale.” Our testing shows that by dynamically inserting the searcher’s phrase — “pretend-a lasers on sale” — into the subsequent landing page, a conversion rate increase of up to 20 percent is possible. This insertion can be accomplished easily by most webmasters. Shoppers should see this, which immediately confirms they are in the right place by emphasizing the phrase they used in their searches. The search term “Pretend-a Laser” is dynamically inserted on this hypothetical landing page. No search term appears on this hypothetical landing page. One way that LT2 can eat into its competitor’s conversion rate advantage is to run time-sensitive promotions — such as “Free Upgrade to Overnight Shipping.” — when its competitor isn’t. While it is easy to adjust a PPC ad to reflect this new promotion, LT2 should not make the common mistake of many online retailers of not living up to the expectations that their PPC ad copy creates. Instead, LT2 should make sure the promotional offer promised in the PPC ad copy is highlighted and reinforced on its website. When shoppers search for “Pretend-a laser” — a specific brand — it’s likely that they are further in the decision-funnel than if they searched for a broad term like “lasers.” LT2 should embrace the shopper’s focus by “shrinking” its site and removing navigation options and content that doesn’t cater to the shopper’s intent. To do this, LT2 should follow the following steps. Remove or de-emphasize less relevant navigation choices. In the example below, the left navigation was removed from the landing pages. We’ve seen conversion rate increases of up to 25 percent by removing the left-hand navigation on internal pages, although we recommend testing this on your particular site first. You will also need to address the search-engine-optimization implications. You can compensate for the lack of navigation options by (a) offering a “continue shopping” button that brings shoppers up one level on your site, (b) relocating the left-hand navigation further down on your site, and (c) by implementing navigation-path breadcrumbs. Show more relevant product options above the fold. In the example below, more product thumbnails can fit above the fold thanks to the space gained by removing the left navigation. Give the shopper relevant shopping tools. 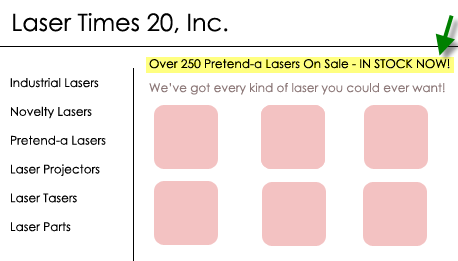 Also in the example below, the shopper has been given sorting tools that are clearly relevant to “Pretend-a Lasers.” In tests, we’ve seen tools like this one create conversion lifts between 25 percent and 75 percent. This landing page removes left hand navigation, places product thumbnails near the top of the site, and offers “Use,” “Price,” and “Color” shopping tools. Your opportunity to convert a shopper into a customer does not end when the shopper abandons your site. The shopper may return later when he or she is ready to buy. To increase those odds, implement retargeting campaigns with motivational messages. Retargeting is a feature of Google AdWords that allows you to tag visitors to your website and advertise to them through Google’s Advertising Network as they browse other sites on the Internet. Many online retailers utilize retargeting simply by creating ads that showcase their brands or basic promotions. Shoppers see these ads as they browse other sites on the Internet. Unfortunately, these ads often do not motivate them to return to the retailer’s site and buy immediately. LT2 can make their ads more motivational and relevant by updating them regularly with time-sensitive offers. For example, a prospective customer who abandoned LT2’s site may see an ad for LT2 with a special offer that expires on Memorial Day. That time sensitive offer may increase the shopper’s motivation to buy quickly. Increasingly, shoppers are using mobile devices, such as smartphones and tablets, to browse the Internet and make purchases. LT2 should identify — via its analytics program — the percentage of visitors who access its website through mobile devices, and if that percentage is significant — 10 percent or more — LT2 can optimize its current site for mobile viewing, or build an entirely new mobile site. While this can help LT2 increase conversion rates, its efforts should not stop there. If LT2 finds that it can convert mobile shoppers by optimizing for mobile devices, it should separate its mobile PPC campaigns from non-mobile ones. That will ensure only mobile searchers see mobile ads. Mobile campaigns should receive a separate budget, ad copy for those campaigns should reference that they are mobile-user-friendly, and a unique bidding strategy should be developed to cater to mobile searchers. Shoppers behave differently when they use their mobile devices, and to optimize conversion rate among mobile and non-mobile searchers, campaigns for each segment should be optimized separately. The higher your conversion rates, the more you can afford on advertising clicks, and the faster your revenue and profits will increase. While your competitors optimize their PPC campaigns by addressing pre-click factors, your business should address the post-click factors, and grow.